You may think that PRESIDENT Donald Trump is/has been part of the establishment. He certainly has hung with the elitist crowd most of his life. But, the establishment has always sought out the wealthy and vice a versa. They learn to feed off one another. In that respect, Trump certainly has benefited/USED people of influence. However, I truly believe Trump would rather have a cup of coffee or share a slice of pizza with us regular Joe’s than bump elbows with a Nancy Pelosi. 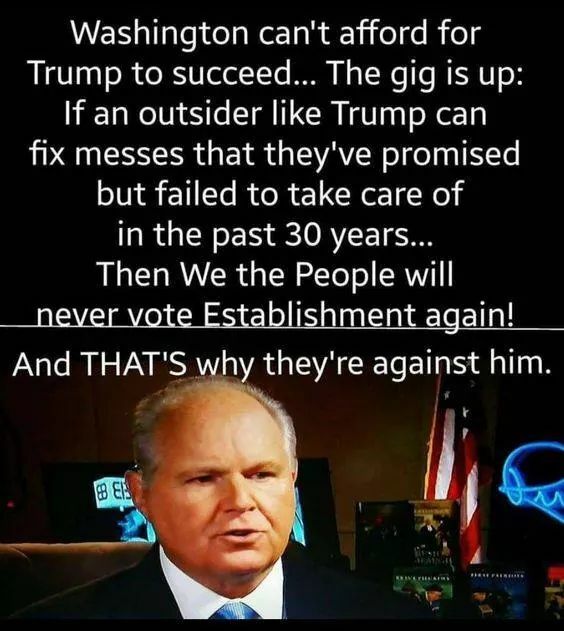 I believe he is committed to MAGA and he is smart enough to know that can’t happen with an establishment D.C. only interested in spreading their own wealth and power. That is what they are desperately trying to hang on to…….. They made this war on Trump out of their own greed; they have no interest in the American people. They are not service driven, they are greed driven. Look at the Clinton’s, they stole from the American people; abused their power, under their pretentious guise of service to our nation. They socially rapped the American people, just as Bill did with his history with women. They should be in PRISON! The Obama’s ……….they are an endless corrupt story as bad as the Clinton Crime Cartel. Hillary, Lynch and Obama under protectionist James Comey gang rapped America. It’s all being exposed under the Trump presidency. The media and D.C. elitists will continue to bash Trump everyday……. The CIA are trying to keep Trump from releasing the JFK assassination documents (scheduled for Oct. 26th). Documents and information that should NEVER have been under lock-up and hidden from the American people in the first place. The only reason for a lock up is to keep the truth from the American people of the criminal, treasonous behavior of those in high places (the D.C. Establishment) and government officials. The establishments greatest fear IS We the People. Trump has too close a relationship with We the People, the real people. That is the D.C.’s greatest fear………so that are at war with all of us. What have they done for you lately?